Select a ball that best fits your swing speed. Golfers spend hours getting properly fitted for golf clubs and invest hundreds of dollars for the latest in club technology, but the sometimes overlook the options available in golf balls. Golf ball technology has come a long way from the "featheries" of yesteryear. Those balls were basically leather sacks stuffed with wet goose feathers. When the feathers dried, the ball filled out. Featheries were a vast improvement over the wooden balls preceding them, just as modern balls are a substantial improvement over the first rubber balls called gutties. 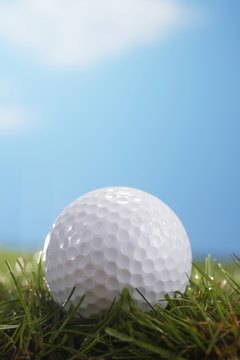 Golf balls are manufactured to favor distance or control, although ball manufacturers try to reach a compromise between the two with some models. Distance balls have a lower spin rate, which results in a longer shots. The covering is made of a harder material, such as surlyn, rather than the softer urethane. But the low spin rate and hard feel make these balls more of a challenge to control -- around the green, for example. Recreational players with higher handicaps often prefer balls that are designed to travel a longer distance. Balls made for control have a soft feel when struck. Their increased spin makes the balls more maneuverable around the green and out of tough lies. The dimple pattern on the ball facilitates this control. The dimples reduce the drag on the surface of the ball, causing it to stay in the air longer. If you're an accomplished amateur with a low handicap you'll probably prefer a golf ball that gives you more control. According to "The Golf Book," the differences between distance balls and control balls are less obvious than 20 years ago. Advances in technology, manufacturing processes and materials have resulted in the compromise ball, allowing longer distance than a control ball but a softer feel than a distance ball. The golfer can get the best of both types of balls. Some balls have a core that gets softer toward the center. Soft cores cause greater energy transfer upon impact, resulting in longer distance -- and also softer feel. This design helps golfers with lower swing speeds increase their potential distance. Choose a ball that matches your swing speed and strength. The USGA puts limitations on the size, weight, speed and the potential distance of golf balls. The initial velocity and distance as tested using USGA equipment is limited, and the standards are updated to reflect the currently available equipment. A ball must be no smaller than 1.68 inches, but there is no limitation on how large it can be. It must weigh no more than 1.62 ounces, but it can be lighter.